You'll be £25.00 closer to your next £10.00 credit when you purchase Leeds Rifles. What's this? The Leeds Rifles is a detailed chronicle of the four Battalions of Riflemen who left Leeds for the Western Front. In 1914, just as now, they were more numerous and less fashionable than the City Battalion, The Pals and their full war time story has never been told. This volume describes their volunteer origins and how they came to be woven into the social fabric of Leeds from where they drew their enduring esprit de corps, discipline and resolve. It takes the reader on a journey across the Western Front contrasting the First Line Battalion's lot, to stand in the mud of Ypres and endure all without breaking, with the Second Line Battalion's ‘blooding’ at Bullecourt and transformation as part of an elite assault Division that went on to occupy Germany. It’s told in part, by those who were there and experienced the fear, elation and the sadness of loss and who took strength from their volunteer ethos and their common origins in Leeds. All the Leeds Rifles' main battles are described in detail as are the helter-skelter actions of the Last 100 Days of ‘mobile warfare’ and escalating casualties, when the defeated but still defiant German Army found itself in full and final retreat. Follow the fortunes of these ‘enfants de Yorkshire’, these Leeds Lads as they speak out from the pages of history with a very familiar accent. Andrew Kirk’s passion for telling the stories of the Leeds men shines through and makes this volume another valuable addition to the ever-growing number of unit histories. Great photographs support this special story, such as various photographs of different Rifle groupings, and the dedication of the Leeds Rifles Memorial next to the Parish Church on 13th November, 1921, The author has a close connection to this story with his family having served in the 2/8th West Yorkshire Regiment, the Leeds rifles. This connection and passion is made continually clear throughout the book. The author makes use of the war diaries and the Liddle Archives at Leeds University to provide a chronicle of events which flows well and is a pleasure to read. 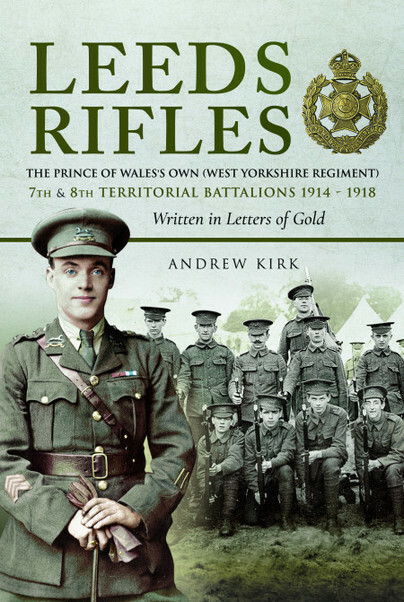 Andrew Kirk's family served in the 2/8th West Yorkshire Regiment, The Leeds Rifles. This was a well established volunteer formation before the First World War whose profile and standing has been eclipsed in modern times by the better known Leeds Pals Battalions. In depth research has revealed the fascinating story of four active Battalions of Leeds Riflemen as they journey across the Western Front contrasting the fortunes of the Infantry Divisions they were a part of and detailing their hardships, disasters, losses and triumphs. This book describes in detail for the first time the orders, operations and activities of the high morale Leeds Battalions which maintained their effectiveness, professional pride and Yorkshire grit to the very end. Andrew Kirk, now living in the East Midlands, educated at Roundhay School and Leeds University continues a career in Logistics and maintains a keen interest in Military History and the Western Front in particular.